So when I dug out this expansion last year, it was not surprising that I chose annuals and perennials that flow together but the two sides of the curves on either side of the flagstone pathway (not visible here) do not look the same. 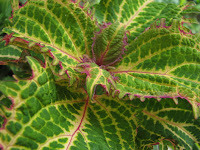 Coleus, like caladiums, offer many varieties of shape, texture, form, and especially color without blooms. You may remember from a previous post that a portion of the bed you see here is planted in a shallow (12"x 38" ) bowl which I still love (it's good to love your stuff isn't it?). It raises up a portion of the display to a little higher level allowing yet another dimension to the design. I have no idea the names of each coleus except (I think/hope) one of them is inky fingers. Isn't that the coolest name? It is the one with the dark center and lime green curly edging. These were planted in April and May and have been cut back a couple of times already. I'm rooting cuttings in the ground right next to the ones already in the ground. It is very easy to do this. Just cut off the tops and stick them in the ground where you'd like a new plant and be sure to keep it moist until it roots. 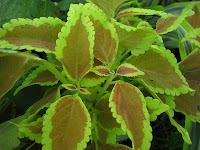 Several coleus are placed in potted containers throughout the garden as well. I haven't shown those yet but wanted to mention their valuable use in pots as well as the ground. I love your coleus. I plant several each summer. I just cut back the few I have this summer and brought inside the cuttings as a bouquet. They are just wonderful. Your garden is just wonderful. It is so lush. You have created a tropical paradise. your colourful greenery is so great. ok, i definately need your input. my yard is still in the deciding stages of what to put where. i thought of something. in february the nashville antiques and garden show comes here and it is amazing. you could plan to come up and visit and see my yard and layout and give me ideas. then, we could visit the show and you could take home some incredible finds. sounds like a plan?? at least think about it! Your coleus are so colorful and the texture & pattern are fantastic. I almost bought some this summer. Coleus are so easy to grow and propagate. I'm not a matchy-matchy kind of person either.Usually, if you surround yourself with things you love, they just seem to work together. Your garden design definitely works. It looks beautiful! Lisa: I adore the bouquets of coleus too. They root easily in a vase as well. The garden is alive right now with tropical mosquitoes as well as all the lush layers. They love to hide under the plantings. Too bad we have to take the bad with the good dont' we? marmee: I'm liking your plan. 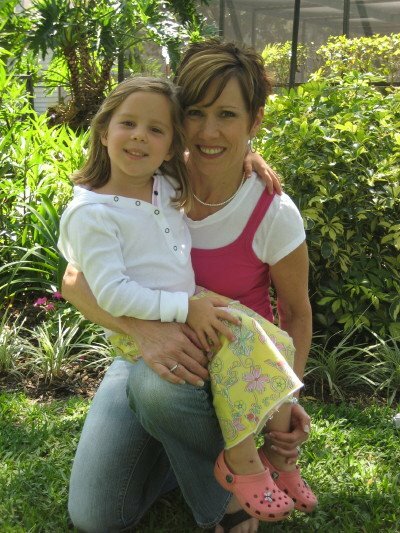 The sound of February makes we wish for our beautiful Florida February right about now... aaaaggggghhhh... this heat! perennial gardener: I do love the the variety of forms and they are so easy to grow... no maintenance except keeping them pinched back so they stay bushy. shibaguyz: Thanks for stopping by. Year round gardening is challenging. It isn't really a choice... if you want to garden here it has to be done all year in order to keep up. Sometimes I think having a break would be nice too. Robin: You are right about "things you love". It does seem to work out that way. Coleus are beautiful....they are classed as annuals here and have to be replaced every year. I used to use them a lot in containers and they make a wonderful display in the garden. To be able to use them in the beds would be wonderful but that is never going to happen here.....old jack frost would soon get them. Meems, I like Coleus too. The colours are gorgous and when they seed, I always let some, one can get new patterned plants. 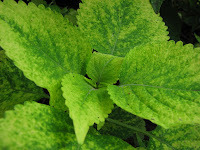 "Your" inky fingers is a cool coleus,to use my grand childrens jargon! I haven't seen this one around. When I read about your Florida climate it sounds just like ours. I have a similar approach in gardening like you, perhaps not as tidy as you! When it matches it is mostly an incident. Generally I am surprised how nature usually falls into place with my plantings.) Thank you for you visit. This is a lovely flowerbed - very nice composition! I don't like too much symmetry either, I like a garden look more spontaneous. However, I do like the plant that you've used surrounding this bed - what is it? Lovely meems. I could use a bit of your skills to create flow and balance. Sometimes I think my garden is chaotic! You must have wonderful soil to be able to stick a plant in the ground and it will root! I found Dwarf Katia (?) Mexican Ruellia on the sale table at a local nursery. I can see the attraction; her leaves have the look of a seersucker sedge and her flowers are so like the other Ruellia, perhaps darker. I did read she might not be as invasive...I think 'as invasive' is the phrase that makes me smile! Thought you might like that! You've inspired me to get more caladiums. I have a few in my front shade garden, but now I'm thinking they look a little too sparse. I am also thinking of using them as a border plant in the back yard as well. I have tons of coleus inside- but not outside...I have some that I have been rooting-maybe I should see how they do outside as well!Thanks for the inspiration! I'm with you on symmetry Meems, and feel the same about matching stuff in my clothing and interiors. In my book, the words "living room" (or dining room, or bedroom") and "set" don't belong together in the same phrase. I love coleus too, and have them mostly in containers. Last year I overwintered cuttings, and didn't buy any at all this summer. They're on sale for a buck at the nursery, think I'll pick up a few since I only took cuttings of three varieties last year. I've never thought of bringing them in for vases. Thanks for mentioning the idea Lisa! It's time to cut back some coleus! Cheryl: Coleus are classed as annuals here too only they act a little like perennials in that they can actually last through a couple of years depending on the weather. Location is important as well. Putting them in the ground does add to the many ways they can be showcased. But I love them in containers just as much. Titania: Tidy is a good way to describe the way I like things. Meandering, asymmetrical,... but tidy. I'm not familiar with getting new varieties of coleus from seeding... now that sounds like a whole other dimension I'd like to explore. Katarina: I forgot to mention the border the plant... thanks for reminding me. 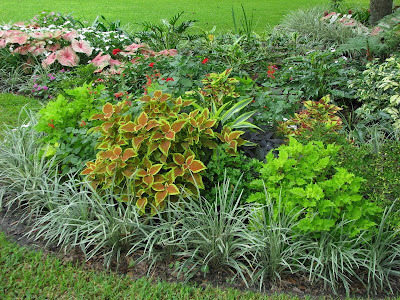 Using the same border plant around this particular bed gives the entire look a feeling of unity. It is called variegated liriope. I use it in so many of my borders because I don't have to purchase it anymore. I dig up larger existing plants and separate them out at the root ball to make more plants. Right now they are blooming- not a showy bloom but faithful to show up each summer. They are spikes of tiny white clustered blooms that cover the length of each spike. Hardy in Zone 6-11. 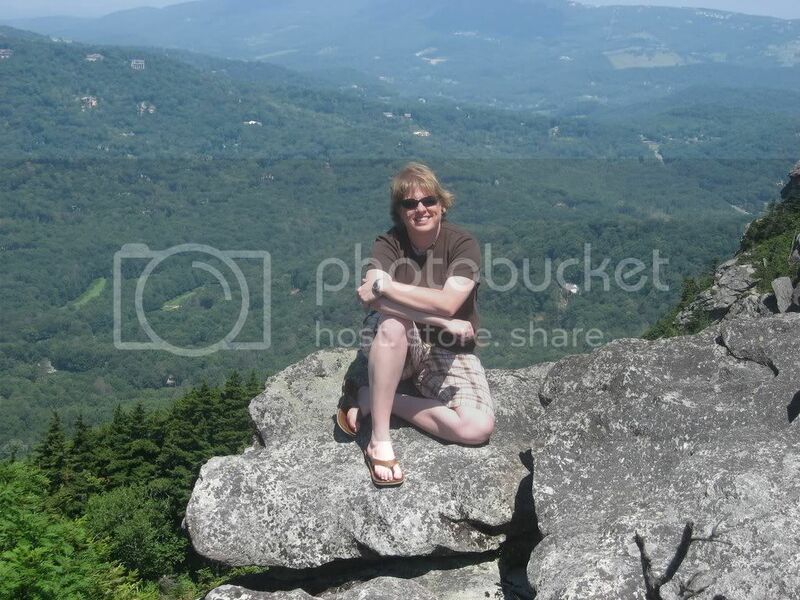 Gail: Your garden is very different than mine and I like that! I admire you for working with your clay and limestone... I'm not sure I would be so tenacious in those conditions. I SO LOVE my soil. I left some of the cuttings of coleus laying next to the plants last week (mind you not stuck in the ground- just forgot to gather up to throw in the compost after clipping them) and where they were touching even the smallest amount of dirt they began to root themselves. I was even surprised by that display of hardiness. From all that I've read and have observed in other gardens in this area dwarf ruellia behave much differently than the kind I have here. And yes their foliage is even a bit different- both very appealing. 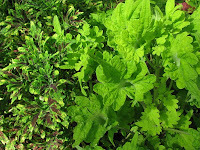 The dwarf variety can actually be used as border plants without any threat to spreading. 'As invasive' is an interesting way to mark a plant. The flower can be dark bluish/purple or white in the dwarf variety. susiesqs: You're welcome... inspiring makes me happy. My DIL and son live in Tallahassee and grow many varieties of caladiums prolifically in their clay beds amended with soil. I have to say I'm a fan of grouping them in mass for impact rather than sparsely spotting them here and there. It isn't too late to put your rooted coleus in the ground either. They won't survive your winter but you have quite some time before the first threat of frost and they make a wonderful addition to the autumn months in the garden. Linda (garden girl): Ecclectic is my style indoors. Makes for so much more excitement when out and about shopping for that 'just right' piece doesn't it? Ooooohhhh, I bought some 1 gal. plants (not coleus)at the big box store last week for a $1 each.... shhhh! Don't tell anyone. My family might put me away if they knew. I'll be slipping them (not my family but the new plants)into the landscape tomorrow morning early. If I hadn't been in such a hurry that day I stumbled upon them, I would have bought more so it's probably good I haven't had a chance to get back there. Sorry, I got distracted. 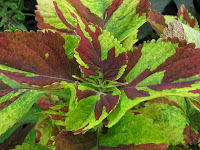 I think now is the time for you to grab up a few more variety of coleus for $1... I mean how can you lose? Then you'd have more to overwinter. woo-hoo. They make a really pretty display in the kitchen window (well not all kitchens have a window but if it does)if you place them in a few different shapes and sizes of bud vases. BTW- Like the new pictures you added today! mjm: Thanks... they are my August updates.